Rosetta Stone Inc. is known worldwide for innovative, personalized language and reading programs that have been used by thousands of schools, businesses and government organizations, and by millions of individual learners. But what many may not realize is that Rosetta Stone has called Rosslyn its global headquarters since 2007. The company, which was founded in 1992, has pioneered the use of interactive software to accelerate language learning. Rosetta Stone's programs help people speak, read, write and think in a new language. They provide access to a language learning community, with tutoring sessions that enable participants to speak with a live coach. They also employ Rosetta Stone's proprietary speech-recognition technology, which offers instant feedback, and interactive games to help reinforce learning. "Many recognize Rosetta Stone as the trusted leader in language learning, but what’s exciting about working here today is seeing how it has evolved from the iconic yellow-box, CD-ROM product to a fully digital product that's available on a number of platforms, enabling people to learn on the go via mobile devices or at home on their PC," says Michelle Alvarez, head of global communications. According to Alvarez, Rosetta Stone has expanded its offerings in recent years, acquiring Lexia Learning in 2013, a technology-based literacy company that has helped increase reading proficiency for more than two million children across the country — a perfect complement to Rosetta Stone’s language-learning products. Additionally, Rosetta Stone’s Fit Brains business offers personalized brain training programs on various digital platforms developed by neuroscientists and game designers. Rosetta Stone's global headquarters in Rosslyn employs about 125 people who work in a number of disciplines, from marketing and web strategy to legal, human resources and product development. Carol Paiva, director of product management, oversees an international team of product managers based in the U.S. and other countries, including France, China and India. She has worked at the Rosslyn headquarters for six years. Paiva says product managers “drive what our developers need to build” and coordinate launch activities for new products. “We make sure we understand what the market needs and ensure that we are incorporating it in our products,” she says. Photos: Top of Page: Around 125 staff work at Rosetta Stone's corporate headquarters in Rosslyn, Pictured are Michael Elshaw, Retail Sales; Todd Simmons, Marketing; Ava Donald, Operations: Hermes Marticio, Web Strategy; Julia Randhawa, Consumer Strategy; and Michelle Alvarez, Communications. 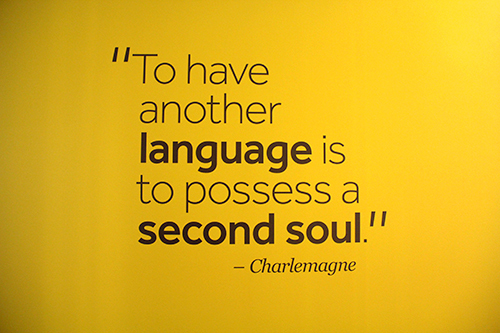 Right: This quote about languages, which is painted on one of the walls at Rosetta Stone's headquarters, encapsulates the love of languages that drew many employees to the company.